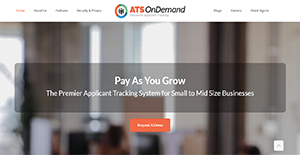 ATS OnDemand is a unique and scalable applicant tracking technology. It provides businesses with the most important tools when it comes to monitoring applicant touch points. Moreover, ATS OnDemand assists companies in broadening their reach when it comes to the search for the best talent for open positions. That is why the application supports job pushes to different job boards as well as to social networking sites. Furthermore, ATS OnDemand makes it easier for talents to send their applications. The software is accessible even on mobile devices so those on-the-go can express their interest effortlessly. Plus, ATS OnDemand aids organizations in migrating their data from their existing systems. This way, they can continue operating without fear for lost or incomplete information. With ATS OnDemand, companies and agencies are able to disseminate information regarding open positions to a variety of online job boards. These include Indeed, US Jobs, Glassdoor, and LinkedIn. In addition, the software also supports posting of jobs on social networking sites to broaden the reach and search for the most qualified talents. ATS OnDemand makes it painless for job seekers to express their interest in one or several positions. The application makes it so by providing a mobile app and one-page forms. This provides them with the flexibility to choose the method that best works for them. Papers documents can be cumbersome and are prone to damage or less. That is why ATS OnDemand is equipped with an onboarding portal that does away with papers. It can capture e-signatures with ease to speedily close employment contracts and also ushers along new hires with smooth communications. One thing that sets ATS OnDemand is its unique pricing plan. There are no set packages so interested businesses are able to choose the features that they need. This allows them to stay within the limits of their budget and to save money as time goes by. Since ATS OnDemand does not have rigid packages, users are able to add more features to their system as they grow. This enables them to expand their operations and to further streamline their processes. If you are considering ATS OnDemand it might also be beneficial to investigate other subcategories of Best Applicant Tracking Software gathered in our database of B2B software reviews. It's crucial to keep in mind that virtually no app in the Applicant Tracking Software category will be an ideal solution able to fulfill all the requirements of various business types, sizes and industries. It may be a good idea to read a few ATS OnDemand reviews first as certain services might excel just in a very narrow set of applications or be designed with a really specific type of industry in mind. Others can function with a goal of being easy and intuitive and as a result lack complex elements desired by more experienced users. You can also find solutions that cater to a broad group of users and offer a complex feature set, however this frequently comes at a more significant cost of such a solution. Make sure you're aware of your requirements so that you choose a solution that provides specifically the elements you look for. How Much Does ATS OnDemand Cost? ATS OnDemand is a unique pay-as-you-go software with core features and optional add-ons, and offers no fixed enterprise pricing plans to consider. For more information, sign up for a demo and request a quote. We realize that when you make a decision to buy Applicant Tracking Software it’s important not only to see how experts evaluate it in their reviews, but also to find out if the real people and companies that buy it are actually satisfied with the product. That’s why we’ve created our behavior-based Customer Satisfaction Algorithm™ that gathers customer reviews, comments and ATS OnDemand reviews across a wide range of social media sites. The data is then presented in an easy to digest form showing how many people had positive and negative experience with ATS OnDemand. With that information at hand you should be equipped to make an informed buying decision that you won’t regret. What are ATS OnDemand pricing details? What integrations are available for ATS OnDemand? ATS OnDemand integrates with all major background check solutions and calendars. If you need more information about ATS OnDemand or you simply have a question let us know what you need and we’ll forward your request directly to the vendor.